Gareth Jones was a prominent British journalist and former Foreign Affairs Secretary who brought the Ukrainian Famine/Holodomor of the 1930s into public light in the West. 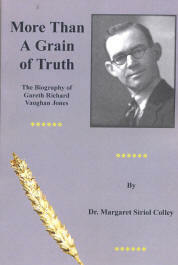 Gareth Jones exposed a famine in the former Soviet Union in 193 3 that killed millions, but was later murdered in mysterious circumstances in Inner Mongolia in 1935. Lecture by Roy Giles CBE, MA, Hon D. Litt. Roy Giles is a former army officer, civil servant, Cody Fellow at St Antony's College, now research consultant. BRIXMIS was initially proposed in the Anglo-Soviet London Agreement of November 1944, as a means of effecting the necessary liaison between the British and Soviet military authorities in postwar occupied Germany. BRIXMIS was in the event "launched" by the Robertson-Malinin Agreement of September 1946, with a base in the main Soviet Zone garrison of Potsdam. Mission strength was set at 31 All Ranks, who were given Soviet military identity cards. There was a reciprocal Soviet mission set up at Bunde in the British zone. Mission members had diplomatic immunity, and freedom of travel throughout the zone in which they were accredited. 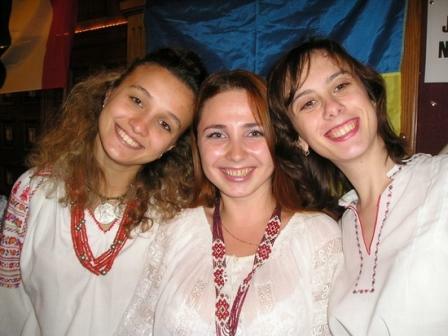 Ukrainian folk songs capture the essence of Ukrainian spirit. Whether lively and humorous or hauntingly lyrical, they vividly evoke Ukrainian past, with its customs and traditions and reveal a wealth of historic detail about the country and its people. 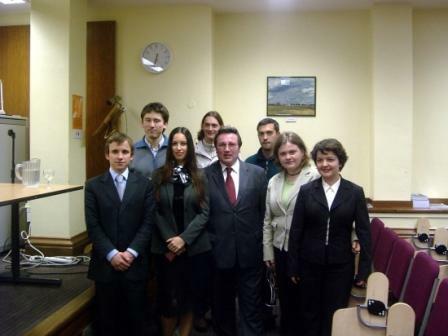 A wonderful opportunity to perform Ukrainian songs in Oxford came about when the Society was invited to perform at the Second International Music Recital and wishing to introduce Oxford students to the compelling Ukrainian music we embarked on creation of a 'choir', enlisting all members of the Committee as well as Ukrainians from London and Cambridge under the creative director, Dzvinka. We chose songs from various regions of Ukraine including two ballads about love (for a young Cossack!) and two comical songs about marriage, deception and parental disobedience! True to the nature of folklore we all knew these songs not from formally learning them at music schools, which not all of us have attended, but from hearing our grandparents and relatives singing them at weddings, family parties and festive celebrations and thus, without music sheets or any instruments, we rehearsed. 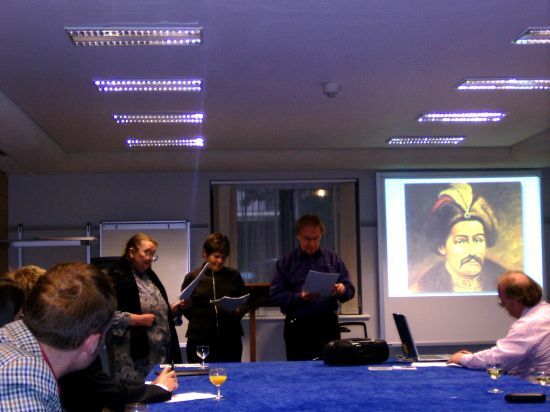 We all enjoyed performing on the night, when, united with London and 'traditional adversaries' Cambridge, we were warmly received by an international audience of a hundred people thereby establishing a successful debut of the 'Oxford Ukrainian Choir'. More photos in the picture gallery. 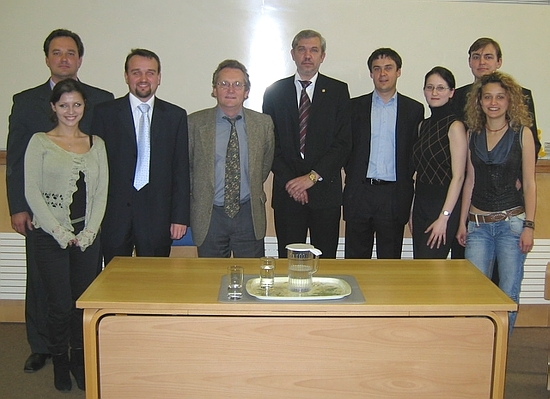 Marat Terterov is a political scientist and recent Ph.D. graduate from St.Antony's College, University of Oxford, as well as the editor/author of over a dozen major books addressing the business and foreign investment environment in countries of the former Soviet Union and the Middle East. Dr Terterov is the contributing editor of "Doing Business with Ukraine" — the most authoritative guide available to investment and trading opportunities, and to the structural, legal and market changes underway in the country. "Yushchenko's first 100 days and beyond"
Lecture by Dr. Sarah Whitmore, Senior Lecturer in Politics, School of Social Sciences and Law,Oxford Brooks University. "Ukraine - from Mazepa to the Maidan"
Presentation of Ukrainian poetry in translation by Ms Vera Rich, famous translator and author. 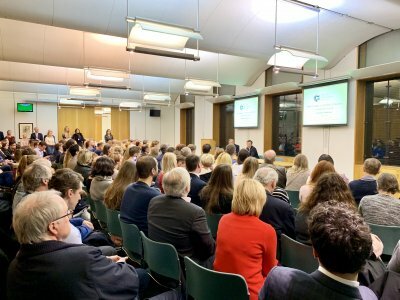 This event was organized by the Oxford University Russian Society and co-hosted by the Oxford University Ukrainian Society. Mr. Mitiukov spoke on current political and economic issues in Ukraine, its foreign policy and, in particular, on Ukraine's chances to join NATO and EU. 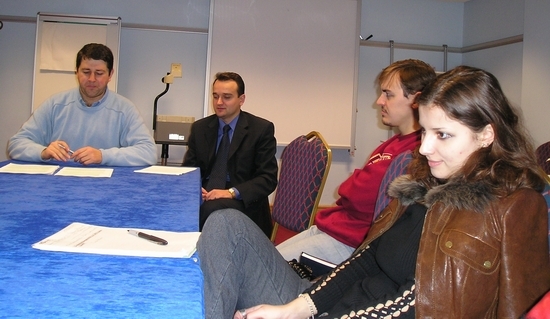 The first key social event in the Oxford calendar for 2005 was a prestigious annual event hosted by the European Affairs society. 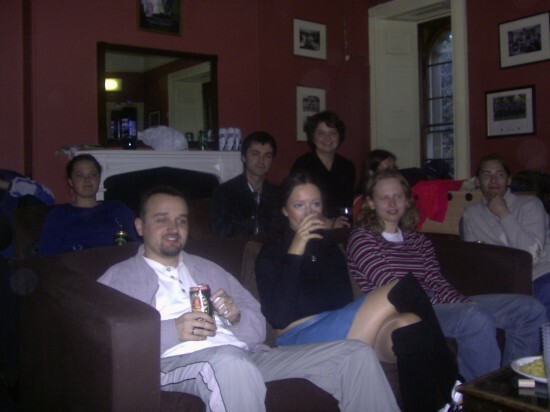 The ‘Spirit of Europe Party' is an opportunity for all national interest societies in Oxford to meet together and compete in a friendly way for the chance to crown their countries national drink as the ‘spirit' of Europe. It was a hugely successful, well attended spirit tasting event where hundreds of Oxford students visited every stall and sampled each society's national drink. There were stalls by a variety of different ethnic societies . After sampling each spirit and meeting with members, the students went onto vote for which society they felt deserved to win. The Ukrainian society proudly offered not only Nemiroff's fantastic medova z pertsem (honey and pepper) horilka but delicious traditional bread, salo and other delicacies which were warmly received by everyone. In addition to the food and drink we Ukrainians offered lively entertainment in the form of folk dancing and singing, which many students were very keen to join in with . We are extremely happy to conclude that we not only WON the entire event by far over the other older societies and were crowned ‘Spirit of Europe' but were effusively congratulated on our efforts, performances and enthusiasm! We are extremely happy that we raised awareness of our society and of Ukraine so publicly and in such a positive manner. Post-party celebrations began immediately at St. Antony's college late bar, joined by lots of curious students who wanted to carry on the party in Ukrainian style. Dancing went on late into the night as did discussions as to what to plan for our forthcoming Orange Revolution anniversary party. 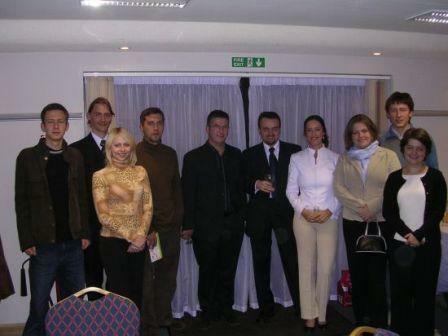 The inaugural event of Oxford Ukrainian Society took place on 7th March 2005 at the Said Business School with the Winner of the Eurovision Song Contest 2004, Ruslana, performing her current and new singles for the audience of students, academics and visitors from all over the world. Ruslana's spectacular performance with her dancers on the stage of the Nelson Mandela Theatre was greeted with great excitement and enthusiasm, creating an electrifying atmosphere and amazing response from the crowd. The singer followed her performance with a talk about her music, her involvement in the recent turbulent events in the Ukraine and her future aspirations and answered numerous questions about her ablum and the Eurovision Song Contest. Ruslana also explained that her music is inspired by Ukrainian customs and traditions, and that her fundamental message is that of freedom and peace. She expressed pleasure at having the opportunity to perform at our "world-famous academic institution" for which, she explained, she has a lot of respect. Afterwards Ruslana and her dancers joined everyone at the reception, talking to students, signing posters and posing for numerous photographs.